Biting cold weather plagues us here in Sweden at the moment. The temperature read minus twelve when I headed out for work this morning and as I cycled through the cold to the train station, I met with a few lonely clouds in the sky and calm air. Beautiful day. The recent days have been precisely like this. 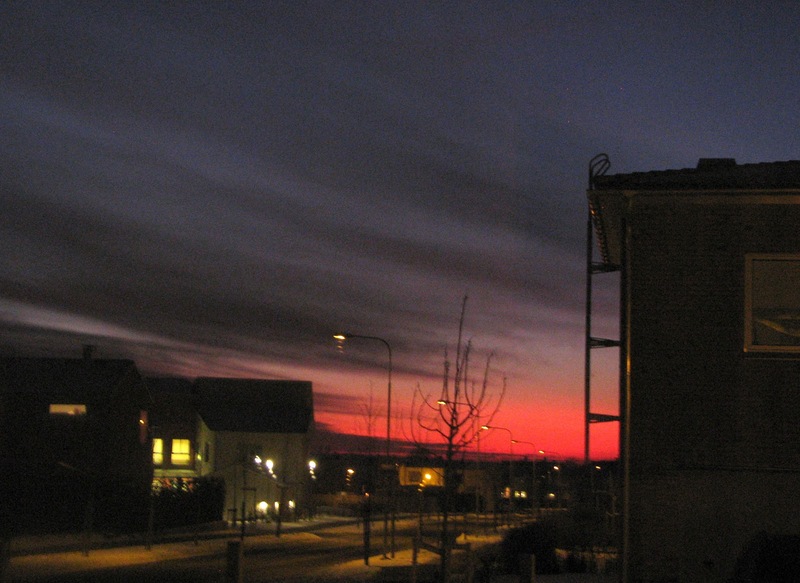 The sunsets have been particularly pretty, even here, with a view toward the road of our newly built neighbourhood in the North of Lund. But, even though the days are beautiful, there is still a need to warm the body, so this kind of weather acutely calls for warm, rich and hearty food. And this can only mean one thing: a savory pie! Steak and Guinness pie to be more exact! I have made an attempt at this dish once before. All hell broke loose … and I was most definitely not to blame … I swear! This is a dish that requires close to three hours of careful cooking. So enough time is of the essence. Likewise, the pie can be prepared the day before, with the finishing touches made the following day (this would in all probability provide tastier results– I believe that most stews can do with a night of relaxation - it gives the flavors time to infuse and mingle). I have to admit, as I always say about the food I cook, that this dish was very simple to make. In regards to the original mess that was made of this – I left it bubbling away at a low temperature while I ran out to play some squash. I handed the chef-duties over to my brother and wife, who had promised to keep a wakeful eye on the concoction, but unfortunately everything had burnt beyond salvation when I returned. So, we ordered a pizza instead that evening – you could say I had certain cause in the matter, maybe I shouldn’t have left the stew simmering at a low heat, but regardless – it is always easiest to blame others! 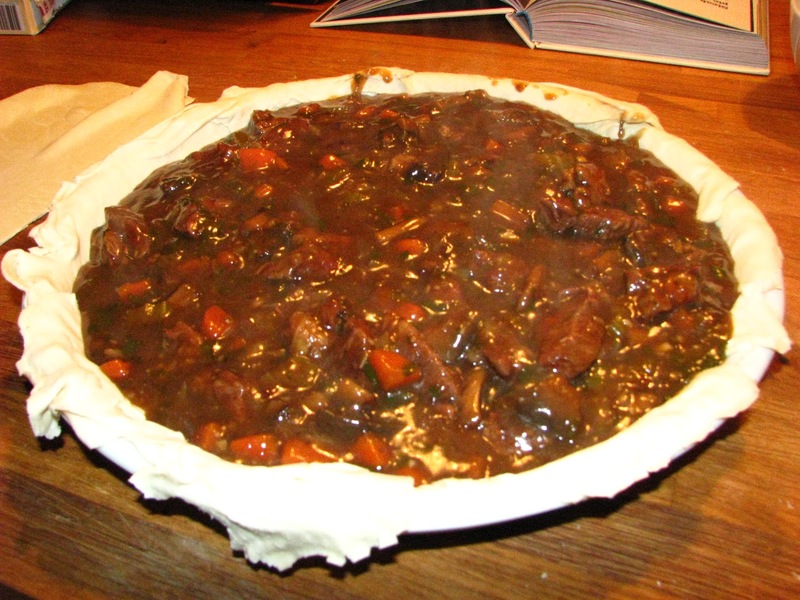 After I made Beauf Beaurgnion ala Julia Childs I became interested in trying to make Steak and Guinness pie again. Julia Childs’s method consisted in placing the stew into the oven on low heat – and I thought that was a great idea. So I cooked the Steak and Guinness pie as laws command, except that I put it in the oven on 120 degrees, went out for another game of squash and hoped for the best. Squash was clearly not he culprit the first time round. Alright, let’s get down to it. Around a kilo of beef, avoid the expensive cuts, but make sure the cut you choose has plenty of fat (the stew is cooked for so long that all the meat will be tender at the time you serve it). Cut the beef into 2,5 cm times 2,5 cm pieces, dry them off with a paper towel and season generously with salt and pepper. Then fry them in hot oil until they are nicely browned on all sides. Make sure not to clutter the bottom of the pot with beef, the meat will ooze liquid that will boil the it rather then giving it the nice caramelised texture we are looking for. When the meat has browned you remove it from the pot and set a side while you prepare the next move. Cut two onions, 5-6 garlic cloves, 2 carrots and 2-3 chalks of celery – which is seasoned and fried in oil on medium temperature for close to ten minutes. Be careful not to burn the veggies. When the vegetables have take on a translucent shine, add the meat back to pot. I had tossed the meat with a bit of flour and in this way you create roux, which helps the sauce to thicken. And now the good part: pour in one and half can of Guinness, with the accompaniment of enough beef broth, seasoning, a couple of tablespoons of fresh rosemary, teaspoon of dried thyme and two bay leafs. Stir everything well together and heat. Place the lid on once it boils and then transfer to the oven and allow it to cook for 2-21/2 hours on 120 degrees (at which point you might as well just go off and do something else). I can never be bothered to make my own pastry – you can get it frozen nearly everywhere, and it is usually delicious. I take just enough of it out of the freezer so it will cover a … , twice. Tuck the pastry close to the edges. Now, remove the pot from the oven, it will smell divinely – I promise! Sometimes you need to thicken stews, I routinely use cornstarch to give just the right texture. 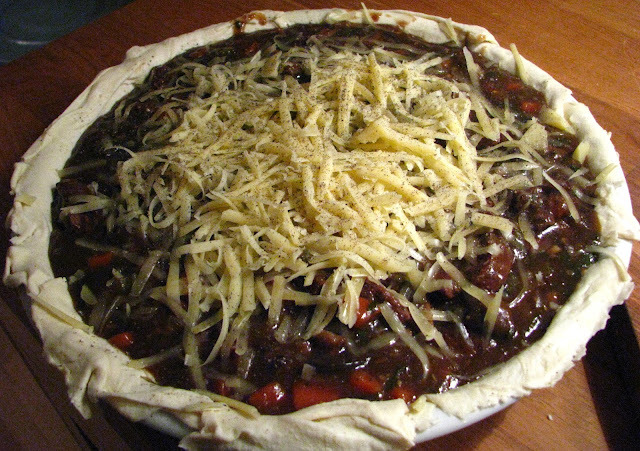 Pour the stew into the … and shred some cheddar cheese into it, and place the pastry-lid on top. It is important to puncture a few holes into the pastry just so the steam can escape. Finally, pencil the lid with some egg wash (egg and a dash of water) and then bake it for another 30-45 minutes, until the pastry is beautifully golden brown. Serve the pie with green pies and home made French fries – potatoes rolled in oil and ample seasoning, baked in the oven until golden, maybe 45 minutes. I had the intention of drinking a glass of cold beer with this meal, but had a change of heart and somehow felt that red wine might be more appropriate - I am always in the mood for some red wine! This dish is rich and tasty in the extremes, and I felt this demanded a full bodied red wine, so I popped open a bottle of Montes Alpha Cabernet Sauvignion from 2006. Crimson coloured and nicely aromatic, the taste has ample taste of dark fruits, oak and is quite full bodied. Long aftertaste. I thought it was a good pair with the Steak & Guinness pie! I am going to try this tonight! Stumbled upon it after googling "steak and guinness pea pie)! You are not going to be disappointed with this dish. It's a house favorite. Thanks for dropping by on the blog!